All gone forever into the abyss. Luckily I have only a small blog or re-uploading could have been a monumental rectal breach. dashingly looking for something to stab and poke. They will immediately run away. "We have the best moustaches this side of the army! Where is our photo coverage?!" My painting goes through a vigorous Quality Control process. Day Two of the Summer weekend game saw six of us fight, each armed with 6 Infantry battalions, 3 cavalry units and 2 guns on a 15 foot table. This felt a really nice game size with Honours of War and the battle flowed back and forth, with results going either way at times. In the end, the bad guys won again, crushing our centre and the left flank I held. Another great day had with the LA guys which has topped me right up with enthusiasm. So much so, I just bought my next two battalions to paint! Deployment. Bad guys on the left, noble good on the right. My Prussians move forward on the left flank but come under harrowing fire from a large gun battery on the hill and some skirmishers in the gully. Gunners offer support to their cavalry as the massed squadrons of the enemy draw close. Worried about a gap, my Grenadiers march to the centre.. The Cavalry Battle. I lost. Redeployment to the centre. To late to be of help. Combat that finished the Left. My Prussian unit killed its British charger but retreated in the protest causing the Poor quality troops behind to run also. Buffs artillery smashes into the flank of the cavalry and wipes them out as he holds grimly onto the hill. Goat and Gary appear to be actually considering tactics. Outrageous. The Bad guys right has now flanked the line and things look grim. Medetian Troops cross the Wheat field. The Loose Association Gamers met up for another weekend of Eighteenth Century loveliness. 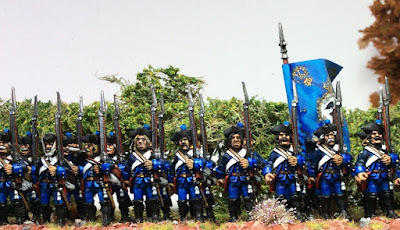 A fictional scenario saw French, Prussian, British and a myriad of Imagination troops fighting for control of a bridge and two settlements over a thirty foot table. Table from the West edge. 16 units of cavalry face each other across the west plain. The Inn of Die Schmiede sits before the Muffe Hills whose scrub finishes at the fast flowing River Wanque. The giant Wheatfield begins a course of gentle farmland that culminates in a large farm. The usual thousands of figures were brought into the lines of fantastic standard from all involved, using figures from most, if not all manufacturers available. LT brought a 15 foot fur to join my 15 feet of newly towelled boards and then bush and bits from all brought the table to life. The Wanque Bridge. Where many a romance blooms. Assault on the farm begins. On the tabletop, Gary, Dave, Jeremy and Goat Major fielded 45 Infantry battalions, 23 Cavalry Squadrons and 12 Artillery Batteries. John, Buff, EB and my own took 34 Infantry, 17 Horse and 11 Guns. Although a smaller force there was a slight terrain advantage but lost initiative rolls, dithering commanders and double moves nullified alot of that. Approximately 3000 figures fought across the table, a small affair for us... At least half of these were likely casualty as the battle in the Wanque valley came to a close. The victory points for the game was 10 for the side holding the bridge and 5 each for both the Inn and the farm. 1 point was given for every enemy unit routed off the table and 2 points for each destroyed. An extra point was given for killing an enemy commander, which happened quite alot! Sadly the bad guys captured every objective and decimated their opponents army. It was a bit of a trouncing but threw up lots of fun, tactical play and momentous occasions. I had an awesome time and many thanks for everyone making the trip and bringing their fantastic figures. We will do again! The British advance on the Grande Muffe. The Cavalry Battle on the West Plain. Medetians with a foothold in the Wheatfield beat off repeated cavalry attacks amongst the crop. The good side has nothing left to attack the well held centre. Thinks are not looking good for the Good's left flank.